At the World SuperComputing'17 Congress in Denver (United States), which brings together more than 10,000 HPC experts, CEA researchers, members of an international team, received the "2017 HPCWire Publishers Award" for outstanding results based on high-performance computing that unlock the secrets of star magnetic cycles (HPCWire Editors Choice Awards 2017, Top HPC-enabled Scientific Achievement). HPCWire is the world leader in new sources of information in the field of supercomputing. Taking a high definition picture of nuclear reactions is now possible with the new ACTAR TPC (ACtive TARget Time Projection Chamber) detector developed at GANIL as part of an international collaboration. The ACTAR TPC device fulfils two functions simultaneously: as a target and as a detector. Indeed, the gas of which it is filled constitutes the target of matter in which the incident ion beam interacts. The European Committee for Collaboration in Nuclear Physics (NuPECC) published its fifth long-term plan on 19 June. 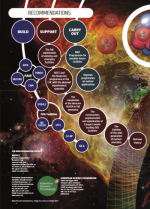 As part of its mission: "to provide advice and make recommendations on the development, organisation and support of European research on nuclear physics and in particular its projects", this plan offers decision-makers and researchers a reference framework for the prospects for the coming years. GANIL (Grand accélérateur national d'ions lourds) and LPC Caen (Laboratoire de physique Corpusculaire) have received a grant of 630,000 euros from the Normandy Region for the MORA project, a research program on the imbalance between matter and antimatter in the Universe. For more than 10 years now, Irfu physicists and engineers have been developing in Saclay the necessary equipment for the GBAR experiment, designed to test the behaviour of antimatter under terrestrial gravity. An important step has just been taken with the installation at the Cern of a new positron source using on an electron linac, and the transport to the Cern of the positron trapping system built at Saclay. The new source produced its first positrons on November 17, 2017. The Near IR Spectrometer Photometer (NISP) is an infrared spectro-photometer that will equip the Euclid Space Telescope (launch planned for 2021) to better understand dark matter and dark energy. After three years of R&D leading to a qualification model, and 6 months for the construction and testing of the flight model, the two NISP cryomotors successfully passed all the acceptance tests in November. Under the dome of the Palais de l'Institut de France of the Académie des Sciences, a prize-giving ceremony took place on Tuesday 21 November. Three researchers from Irfu were rewarded for their outstanding work, in the field of cosmology for Nathalie Palanque-Delabrouille (DPhP) and David Elbaz (DAp), and on the properties of dust and interstellar gas in the Near Universe for Suzanne Madden (DAp). The James Webb Space Telescope (JWST) has reached a key milestone with the completion of cryogenic tests on its telescope and instruments. Working within an international consortium, France, in particular the CEA, the CNRS and the CNES, has played a key role in the development, for the scientific successor to the Hubble and Spitzer space telescopes, of the Mid-InfraRed Imager (MIRIM) that will enable it to see wavelengths of 5 to 28 microns. The physicists from the Compass collaboration at Cern, which comprises a team from Irfu, have just published the results of a new measurement of the quark structure of the proton . This uncommon but eagerly awaited measurement tends to confirm one of the basic assumptions of the theory of the strong interaction, the Quantum Chromodynamics (QCD). Do the two heavy weights of the Standard Model associate with each other? The LHC's Atlas collaboration at Cern has observed a rare process: the production of Higgs bosons in association with a top quark and top antiquark pair. This work, supervised by an Irfu researcher, opens up perspectives on the study of the Higgs mechanism that gives mass to particles. The ScanPyramids collaboration has discovered a new void in the heart of the Kheops pyramid. This large vacuum was detected by muonic imaging techniques conducted by three separate teams from Nagoya University (Japan), CEC (Japan) and CEA/IRFU. It is the first discovery of a major internal structure of Kheops since the Middle Ages. Top quark at the LHC: no new physics in sight yet! 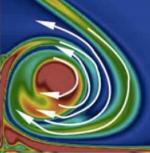 Planetary migration: magnetic or tidal effects ? A large part of the exoplanets known today are in very close orbit around their star, allowing very intense interactions between the planets and the host star. An international collaboration, led by researchers from Department of Astrophysics-AIM Laboratory at CEA-Irfu, has shown that these planets in close orbits migrate rapidly, due to the combined effect of tidal forces and magnetic forces. This study provides essential elements for understanding the formation and evolution of star-planet systems. Using a range of detectors developed with the participation of the CEA, physicists at CEA-Irfu have scrutinized the region from which the gravitational wave was detected on August 17, 2017 by LIGO-VIRGO facilities. Unlike the four previous detections of waves of the same type discovered since 2015, this new vibration of space, called GW170817, is of different origin. It does not result from the fusion of two black holes but of two densest known stars, the neutron stars. The Cherenkov Telescope Array (CTA) consortium brings together 1300 scientists from 32 countries. They have published their scientific aims in a document over 200 pages long. This is the result of several years of work, and includes contributions from approximately fifteen Irfu researchers involved in X-ray and gamma-ray observatories (Fermi, Integral, XMM-Newton, H.E.S.S., etc.). Designed to equip the FRESCA2 testing station at CERN (Facility for the Reception of Superconducting Cables), the niobium-tin dipole magnet of the same name has reached a record 13.3 T magnetic field for a 100 mm aperture. It was designed and developed as part of a collaboration between IRFU and CERN. The objective is a magnetic-field homogeneity 1% over a length of 540 mm. The Cassini probe will finish this September 15, 2017 its mission of more than 13 years around Saturn. On board, the smallest instrument, a detector only 5 millimetres long, was developed by the Department of Astrophysics of CEA-Irfu, which carried it out in collaboration with CEA/LETI (Electronics and Information Technology Laboratory). The faster, more powerful European XFEL free-electron laser was inaugurated on September 1, 2017, near Hamburg, Germany. By producing ultra-bright, trillion-photon X-ray flashes at a frequency two hundred times greater than the best preexisting free-electron lasers (FELs), this next-generation European instrument will allow scientists to map the atomic relief of viruses, decipher the molecular composition of cells, create 3-D images of the nanoworld, and even film chemical reactions. For the first time, an international collaboration involving IRFU has mapped out the largest structures of the universe in 3D, from the movements of thousands of galaxies. This reconstruction includes areas which, until now, were unobservable. The ATLAS collaboration at CERN's LHC has found the first direct evidence for the rare process of high-energy light-by-light scattering, where two photons interact and change direction. This phenomenon was predicted several decades ago by quantum electrodynamics, i.e. the quantum theory of electromagnetism. The data collected between 2010 and 2017 by the T2K collaboration (Tokai To Kamiokande) and the reactor neutrino experiments strengthens the trend announced a year ago—neutrinos and antineutrinos have seemingly different behavior. A dipole magnet, built by a European collaboration involving IRFU from high-temperature superconductors, has produced a 4.5 tesla magnetic field, which is one tesla higher than previous prototypes. Once inserted in a Niobium-Tin dipole magnet, the whole system will produce an 18 T field. In the field of medical imaging, a IRFU team has launched a challenge: their goal is to image the brain activity with a precision of 1 mm3. Its name: CaLIPSO. The idea consists in an innovative detector technology: both light and ionisation signals produced by particle interactions are detected. For this, a series of technological obstacles must be overcome. One of these crucial steps has just succeeded. It consists in implementing the entire chain of ultra-purification of the detection liquid. Thanks to new numerical simulations, a scientific team led by researchers from the Astrophysics Department-Laboratory AIM of CEA-Irfu has succeeded in explaining why the magnetic field of the Sun reverses every 11 years. Scientists have highlighted the existence of a strong feedback between the star magnetic field and its internal rotation profile, with temporal modulations that ultimately determine the period of the cycle. On July 6, 2017, in the presence of Daniel Verwaerde, Chief Executive Officer of the CEA, André Syrota, Advisor to the Chief Executive Officer, Claire Corot, Director of Research and Innovation at Guerbet, Serge Ripart, Director of Imaging at Siemens Healthcare France, and Gilles Bloch, President of the Université Paris-Saclay, the 132-tonne giant magnet of the Iseult project officially integrated the NeuroSpin research infrastructure at the CEA Centre in Paris-Saclay (Essonne). Physicists from IRFU have announced that no "big brother" of the Higgs boson has been detected at the ATLAS experiment at CERN's LHC. Their results rely on new analyzes with higher sensitivity. In line with its mission to host interdisciplinary research, CIMAP (Centre de recherche sur les Ions, les MAtériaux et la Photonique) will host experiments in 2017 from various sources, ranging from solid-state physics to radiobiology, distributed over 3 beamlines covering a wide range of energy: IRRSUD (~1MeV/A, output C0), D1/SME (~10MeV/A, output CSS1) and D1/HE (output CSS2). The European PLATO mission definitively accepted at ESA. The PLATO space mission (Planetary Transits and Oscillations of stars) was adopted at a meeting of the Scientific Programme Committee of the European Space Agency (ESA) on 21 June 2017. PLATO aims to discover rocky planets around nearby stars, similar to our Sun. 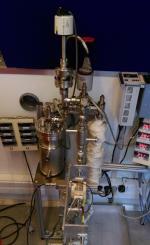 An international team has performed the first spectroscopy of the very neutron-rich isotopes 98,100 Kr. The collaboration, led by scientists from the CEA Irfu and RIKEN (Japan) included several European groups and physicists from IPN-Orsay. This experiment showed that there are two coexisting quantum configurations at low excitation energy in the 98Kr nucleus. An international team from the Sloan Digital Sky Survey (SDSS) has carried out the first large-scale spectroscopic analysis of quasars, and was able to create a full 3D map of the universe and its large structures as it was 6 billion years ago. For now, the standard model of Cosmology, based upon Einstein's general theory of relativity, is confirmed. Using images obtained with the Hubble Space Telescope, an international team of researchers led by Yu-Yen Chang from the Service d’Astrophysique-Laboratoire AIM at CEA–IRFU showed that some galaxies hosting an active nucleus are much more compact than those without nuclear activity. This discovery sheds new light on the physical processes driving the evolution of super-massive black holes at the center of distant galaxies. An international team, including researchers from the Department of Astrophysics (CEA-Irfu) and Department of Solid State Physics (CEA-Iramis), conducted an unprecedented simulation based on the Von-Kármán-Sodium (VKS) dynamo experiment (CEA-CRS-ENS) , to examine more closely how the liquid vortex created in liquid sodium by the propellers of VKS device can generate a magnetic field. An international team including a researcher from the AIM Laboratory-Astrophysics Department of CEA-Irfu has just discovered an elliptical galaxy of completely unexpected shape within the galaxy cluster Abell 2670. Deep observations made by the new MUSE multi-spectrograph recently put into operation at the European Observatory VLT in Chile revealed a highly deformed elliptical galaxy, showing in particular long gas tails and star formation regions normally absent in this type of galaxy. The CERN Axion Solar Telescope (CAST experiment) has ruled out the existence of axions in an energy range that had been unreachable in previous experiments. Axions are light hypothetical particles that would only interact very weakly with ordinary matter, and could constitute dark matter. The unique performances of the Micromegas detector developed at IRFU have contributed to this result. Can Quark-Gluon Plasma Be Produced by Proton Collisions? According to the ALICE collaboration at LHC (CERN), certain rare proton collisions have properties that are similar to those of a quark–gluon plasma. In the past, these properties had been observed for collisions of heavy nuclei only. The physicists are now confronted with a new enigma: how can a state of quark–gluon plasma emerge in a system as "small" as that generated by a collision between two protons? The PILOT astrophysics experiment has been launched the 17th April under a stratospheric balloon from Alice Springs in central Australia. The aim is to observe the polarization of the emission of dust particles present in the interstellar medium of our Galaxy and the nearby galaxies. With a mass of nearly one ton, PILOT  uses the biggest balloons launched by the National Center for Space Studies (CNES). The European X-ray Free Electron Laser has reached one of its final major milestones. The cryomodules used to accelerate the electrons, supplied by IRFU, were installed on-site in Hamburg, Germany. A first electron beam was accelerated across the section of the first 17 cryomodules. A new laser technique developed by a collaboration involving GANIL has allowed for the first study of the structure of different isotopes of actinium. Resonant ionization spectroscopy in a gas will allow for the study of very heavy radioactive nuclei produced in small quantities by SPIRAL2 (one nucleus every ten seconds). The proto-clusters, which are the birth sites of stars, are formed non-uniformly inside molecular clouds of the interstellar medium. 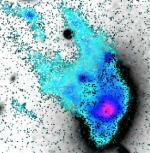 Studying the steps leading to the collapse of pre-stellar dense cores is essential to understanding the star formation. Using both numerical simulations carried out on massively parallel computers and an analytical approach, two researchers from the Astrophysics Department / AIM Laboratory of CEA-Irfu, Y.-N. Lee and P.
The stars do not play dice! It is the extraordinary discovery that the researchers of the Department of Astrophysics-Laboratoire AIM of the CEA-Irfu made by succeeding in determining the orientation in the space of the axis of rotation of stars belonging to two clusters of stars, thanks to asteroseismology. About 70% of the observed stars have perfectly aligned axes of rotation, in formal contradiction with the star formation models which predict that these axes of rotation should be randomly distributed. The electronics developed by IRFU now equips the four oldest gamma-ray telescopes of H.E.S.S. (High Energy Stereoscopic System) in Namibia. Making it possible to optimize the simultaneous operation of all five H.E.S.S. telescopes, and confirming the technical choices for its successor CTA (Cherenkov Telescope Array). Seven planets of terrestrial size and moderate temperature gravitate around the star Trappist-1, a small cool red star located at 40 light years from Earth. Better: at least three of them are in conditions compatible with the presence of liquid water on their surface. At the center of a small galaxy located about 1.8 billion light-years from Earth, a giant black hole swallowed a star for about a decade, which is exceptionally longer than any observed episode of this kind. This discovery was made by an international collaboration involving an astrophysicist from IRFU, thanks to a trio of orbiting X-ray telescopes. Light-by-light scattering, predicted in 1936, was observed for the first time by the ATLAS experiment at the LHC, thanks to "ultra-peripheral" collisions of lead ions. It is of particular interest to physicists, as it is the result of interactions between a vacuum and intense electromagnetic fields. In a study published in Nature Astronomy, the new magazine by the Nature Group devoted to universe sciences, an international team involving IRFU finally revealed why our galaxy is moving at a velocity of 630 km/s. A team from IRFU, a member of the ALICE collaboration at CERN, has coordinated the analysis of J/ψ particles produced during lead-lead collisions at the LHC (CERN). Their results provide a solid indication of the existence of a quark–gluon plasma. Is the Universe Homogeneous on a Large Scale? The homogeneity of our universe is among the founding principles of cosmology—yet are we really sure that it is so? Until now, the main argument supporting the idea that it is homogeneous was based on a coherence test that implicitly used the homogeneity of the universe for its demonstration. Neither a Sphere nor a Pyramid: an Ellipsoid! An international team led by IRFU and the Japanese research institute RIKEN was able to study the structure of a neutron-rich zirconium nucleus (110Zr)—a first, calling certain models into question. Produced by an accelerator at RIKEN and measured by the MINOS detector, this heavy nucleus proves to be more deformed than expected. The dynamical view of the internal structure of the nucleon is conveniently described in terms of ‘electromagnetic form factors’, that contain the information on the charge and magnetic currents created by the constituent quarks and gluons. Electron scattering allows to characterize the nuclear matter, which distribution within a radius of 1 fm (10-15 m) is far from being uniform. Astrophysicists from IRFU have studied the evolution over time of the "wind" in stars similar to the Sun. They were able to perform 3D computer simulations of these stellar winds based, in particular, on spectropolarimetric measurements of the surface magnetic field of the stars. 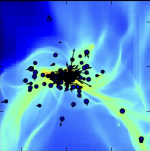 A team of researchers led by Rémi Adam (Laboratoire Lagrange - OCA, UCA, LPSC Grenoble, CNES), Iacopo Bartalucci and Gabriel Pratt (Astrophysics Department- AIM Laboratory at CEA-Irfu) obtained for the first time an image of the gas velocity in colliding clusters of galaxies with NIKA , a new generation millimeter camera, at the focus of the 30 m diameter IRAM telescope of Pico Veleta (Spain).